‘The smell of dead coal hung in the air. 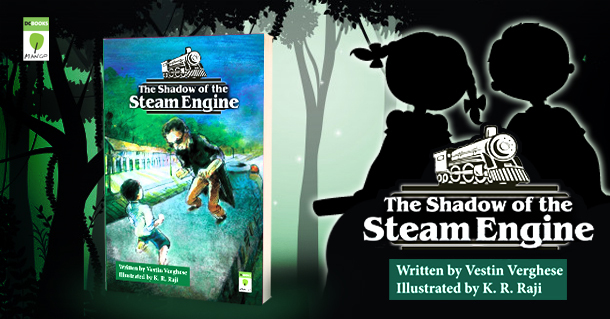 Images of his old home, that the sea had taken rose in Arommel’s mind.’ The Shadow of the Steam Engine by Vestin Varghese begins on a low key, with two kids whose seaside house is destroyed by a tsunami. They are brought to their new home which is an abandoned steam engine. But the grief isn’t there to stay. The kids, Arromel, and Ambilli seem to be an epitome of resilience. They accept the surroundings with grace and move on. With an array of characters joining them, may it be Aunt Menaka, a magician, and Vulture Paramu the kids find their source of joy in the jungle. With the sumptuous spread they have in between like the ‘Kozhikodon kozhi biriyani‘, ‘Kuttanadan duck’ and ‘Malgova mango pudding’ there are umpteen references to indigenous delicacies helping us relish the flavour of the place and the people there. Things take a different turn when Thevar, the sinister figure of darkness is bent on ousting the children from their abode. With his motives shrouded in mystery, it becomes a matter of good versus the evil. In this, the mystery intensifies as the children in the village nearby go missing one by one. Will they lose their home to the powerful Thevar? Will they be able to solve this mystery? Read this classic thriller to find that out.